Barcode Printers Market size in 2017 was over USD 2.4 billion, with global shipments (demand/consumption per year) of over 3 million units. The industry is forecast to grow at over 5% CAGR from 2018 to 2024. Traditional retail methods are gradually losing ground to e-commerce sites such as eBay and Amazon. There is a rapid increase in the number of online buyers across all demographics owing to the rapid rise in the number of distributors, warehouse companies, and enhanced logistic service providers that ensure safe and fast delivery of the online goods bought. Barcodes are cost-effective than conventional labeling, which proves to be a major growth driver for the market. Many stock control systems are now managed by computers; as a result, labels that use human language are now fading away. Businesses are now using bespoke barcodes for their stock control systems. For instance, each piece of stock control hardware can be logged out of and into the storage area of an e-commerce business thereby saving time. 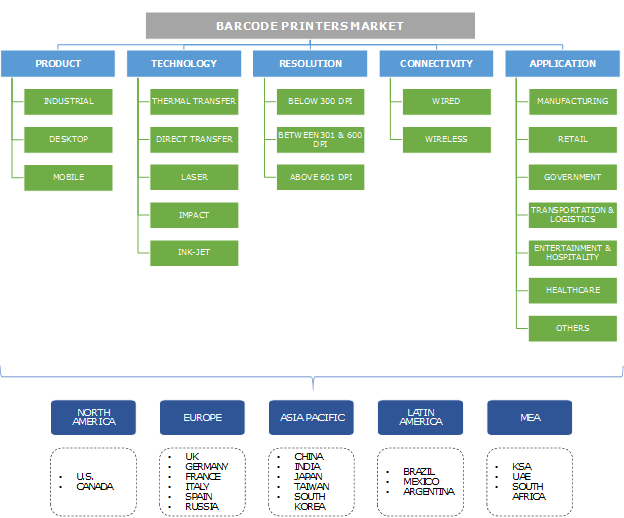 These factors are anticipated to be major driving forces for the global barcode printers market growth. Mobile barcode printers market contributed 10% to the global shipments in 2017. Industrial products contribute significantly to the total revenue on account of the high average selling prices (ASP). The systems deliver advanced print speeds, which are key factors, boosting their demand from industries. Industrial printer manufacturers, such as TSC Auto ID Technology Co., Ltd., Zebra Technologies, Inc. and Wasp Barcode Technologies, offer industrial printers for applications such as transportation, manufacturing, distribution, product labeling, healthcare and patient safety, packaging, and logistics. The wide range of applications of these printers is a significant factor propelling the market growth. 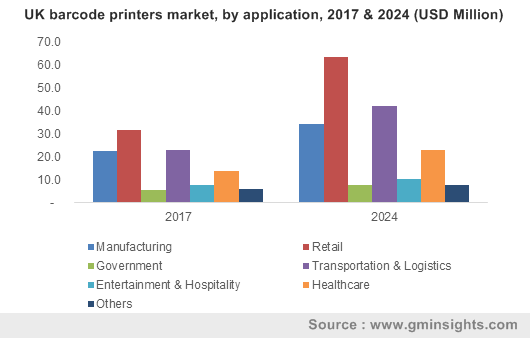 There is a sharp decline in the impact barcode printers market demand due to the increasing adoption of the thermal printing technology by leading companies due to advantages offered by thermal printers. Impact printer works by the direct contact of the paper with the ink ribbon. Dot matrix is a type of impact printer. The lack of precision of the dot placement combined with the low resolution of the printing technology makes these printers highly unsuitable for barcode printing. These printers are inexpensive to purchase. Ribbon ink produces an image that is inadequate for scanning resulting in high error rates. On the basis of resolution, the barcode printers market has been segmented into below 300 dpi, between 301 and 600 dpi, and above 601 dpi. The resolution plays a big role in the image quality and scanning. In case of low barcode resolution, the final image is grainy, which makes it challenging to scan; on the other hand, higher resolution creates sharp images. In some industries (for example, electronics and pharmaceuticals), high resolution is necessary for printing the barcode on small labels. Wireless barcode printers help end-users connect their devices through technologies such as NFC, Bluetooth, Wi-Fi, Cloud, Air Print. They accounted for around 30 percent of the barcode printers market share and is expected to witness growth over the forecast timeline. These printers help the users to reduce a potential failure point and eliminates the requirement of cables, providing more safer and space-efficient work area. However, wired printers enable direct connectivity to PC through a cable and enable features such as USB connectivity, Ethernet and serial connectivity, ensuring hassle free and fast data transfer. With rapid technological advancements coupled with the increasing demand for operational efficiency & streamline costs across the manufacturing sector, barcode has emerged as the most suitable choice for all labeling systems. The manufacturers depend on a well-coordinated line of events to make the operations work in an efficient manner. Business software packages such as ERP, production control, material management, and supply chain visibility applications are dependent on real-time identification and data collection systems to provide data for optimizing the productivity, processes, and profits. The increasing deployment of barcode printers to improve visibility & services and enhance the customer experience is providing an impetus to the Europe barcode printers market growth. These systems help in improving efficiency and cost reduction, complementing the human staffs. Significant cost reduction can be obtained with the use of such technology through expenses saved on errors in shipping, packing, and manual input, allowing the companies to achieve high Return on Investment (ROI). The barcode printers industry is fragmented owing to the presence of many major players operating in the industry. Key players such as Zebra Technologies, Seiko Epson Corporation, Avery Dennison, and Sato Holdings Corporation are stressing on launching new products with the latest advanced technologies. Key players are focusing on further expanding their market reach in untapped regions with strategic initiatives such as mergers and acquisitions. These players are also pressing on expanding their distributor network thereby enabling to enhance their market position. For instance, Indian Barcode Corporation is an authorized distribution partner of Zebra Technologies that distributes its scanners, printers, and other consumables across India. Established companies in the marketplace are increasingly focusing on broadening and strengthening their extensive product portfolio. Companies are devoting a significant number of resources to develop innovative solutions for the respective target audience, making sure that the products & services maintain high-levels of reliability, offering value to end users. For some of the players operating in the industry, the final assembly of the hardware components is performed by the third-party sources, which include joint design manufacturers and electronics manufacturing service companies.